The Internet is a high school, and Teen Witch helps give you the necessary advice you need to get with the cool clique. The young Chicago tastemaker has recently shifted from the digital realm into the physical with his answer to Tiger Beat, TEEN WITCH MAGAZINE. Say a spell and come inside. Everyone on my friends list that is doing something cool and different. I get to watch them grow and it really drives me the most because I just want to build along with them. 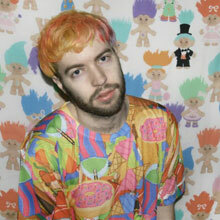 In a rotation of Grimes‘ Visions, Hunx‘s Hairdresser Blues and Nicki Minaj‘s Roman Reloaded. I’m still trying to figure that out. I really love staying in and watching television, but I’m always thinking I’m missing out on everything that is going on. I want to be apart of everything I just don’t want to get out of bed. Get out there; network, create and have fun. I believe in the power of thought, if you think about what you want and think about how to get it it’s going to happen. See yourself as your heroes and stop taping up pictures of people you admire on your walls and put up pictures of yourself in their place. Invest in yourself or you’re probably going to live a pointless life. 6. The internet: what mysteries does it hold? The internet only allows you to know what it wants you to know. Buffy represents all that is girl power! Being acknowledged by people I look up to. For myself, I’m starting to work on getting out a clothing line. I want to put out a few pieces in conjunction with TEEN WITCH magazine that kind of represent each issue. Hopefully that will be out this summer then the next issue this fall/winter. You can destroy it all in a press of a power button.